I often think the multireedist James Carter is able to telepathically channel the creative spirit of the passed musicians he admires. He has paid tribute to many through composition or even full length albums, among them Eric Dolphy, Billie Holiday, and Django Reinhardt. 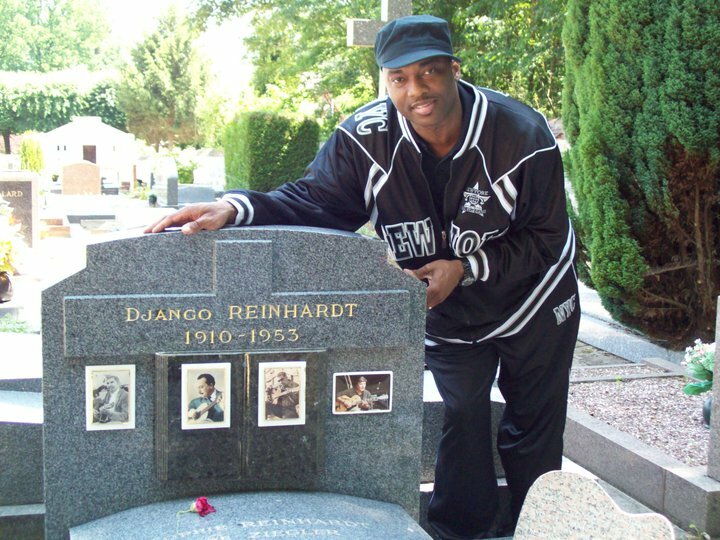 In the case of Reinhardt, and possibly others, the reason for Mr. Carter’s telepathy may be that he has taken it upon himself to visit the final resting place of the original jazz guitar hero, for a first and final musical conversation. Samois-sur-Seine is a small village outside of Fontainebleu, France, where Django Reinhardt retired. Each June, there is a jazz festival there dedicated to his memory. This will be the first time — the centennial year of Reinhardt’s birth at that — Mr. Carter will perform at the festival. “It’s been 10 years in the making on doing this festival, and we’re going to make it count!” Mr. Carter reported on Facebook. Carter is perhaps the most interesting musician to be a part of the Reinhardt resurgence today. Born in Detroit, Michigan in 1969, Carter is a product of the then excellent Detroit public schools music system. Along with his classmate, bassist Rodney Whitaker, Carter would become associated with the neoconservative 1990’s group of musicians labeled the “Young Lions” of jazz — though he has certainly become more than that. His approach to improvising remains impossible to categorize: he combines elements from the avant-garde, having been mentored by Lester Bowie of Chicago’s AACM, with a deep knowledge of the jazz tradition. And his technique on the saxophone is beyond virtuosic. “He knows the history of the saxophone inside and out,” jazz historian Dan Morgenstern told me of Carter. One aspect of Carter’s ability that makes him such a great fit for Reinhardt-style playing is that he is able to emulate guitar techniques on the saxophone, likely something that attracted him to the style in the first place. Carter performs a technique on the saxophone called “slap tonguing.” This is something done with the tongue on the reed/mouthpiece of the instrument that makes a very percussive sound, and when executed in the altissimo range, it sounds strikingly like a guitar harmonic. And through false fingerings, Carter can also emulate guitar tremolos. These extended techniques opened a totally new arena for him to explore through his instrument, on which he has so much control and ability, conventional saxophone playing has never been something that he dwells on very long during his improvisations. This is not to say that he does not have a command of the swing and bebop vocabulary; he does, and well beyond that into the avant-garde. But what is so frightening about Carter’s playing is his time and the power to make you feel notes in the back of your throat. I find this especially interesting because it was Reinhardt’s time that Coleman Hawkins admired so much that he specifically mentioned it to Morgenstern in conversation. Carter’s 2000 release Chasin the Gypsy (Atlantic) features mostly Reinhardt-style repertoire in a somewhat traditional instrumentation. Carter is joined by his cousin Regina Carter on violin, Romero Lubambo on nylon string guitar, Jay Berliner (though Howard Alden was rehearsed for the session but the date was changed and Alden was previously engaged for a tour) on steel string guitar, Charlie Giordano on accordion, Cyro Baptista on percussion, Steve Kirby on bass, and Joey Baron on drums. Chasin’ the Gypsy is a roller coaster ride through original, standard, and Reinhardt compositions. It is one of the few recordings made entirely in tribute to Reinhardt that is not led by a guitarist. Carter’s two most recent recordings, Present Tense (Emarcy 2008), and Heaven on Earth: Live at the Blue Note (Half Note 2009), include the Reinhardt compositions “Pour Que Ma Vie Demeure,” and “Diminishing,” respectively. These recordings were made with a more straight-ahead jazz instrumentation. Present Tense includes D.D. Jackson on piano, James Genus on bass, Victor Lewis on drums, Dwight Adams on trumpet, and Rodney Jones on guitar. Heaven on Earth: Live at the Blue Note includes John Medeski on organ and co-leading, Christian McBride on bass, Adam Rogers on guitar, and Baron on drums. The instrumentations of these very contemporary stylistic jazz musicians makes for an interesting take on the Reinhardt compositions, especially. On these recordings Carter cuts to the edge of modernism, using Reinhardt’s inspiration as a vehicle. The festival in Samois-sur-Seine is a multi-day event, packed with energetic Reinhardt stylists, modern and traditional jazz performers, and campfire jam sessions that can last until the next morning’s café au lait. Carter, with his enthusiasm and stamina (at his 40th birthday party I witnessed him blow on the Benny Golson tune “Killer Joe” for upwards of 45 minutes) will have no problem fitting in. Great picture and article! Waiting for the Hot Club of Detroit to perform at the festival so I can experience the magic myself!